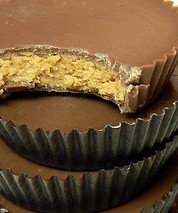 I have loved Chocolate Peanut Butter Cups ever since I was a little girl. They have always been one of my favorite chocolate treats. I would start by nibbling all around the edges first, saving the middle bite for the very last. Mmmmm. I'm actually nibbling on one right this very moment. That's why you'll find chocolate smudges on my keyboard! But, it didn't take me long to sample a variety of peanut butter cups from various suppliers. I can't say I ever found one that I didn't like. If you are looking to order yourself a stash, why not try some from this collection of mouthwatering morsels. Can't bear to wait for delivery? Just go ahead and whip up some chocolate peanut butter cups at home. Really, you can do it! Combine the peanut butter, salt, and powdered sugar, stirring until firm. Melt the chocolate chips over a double boiler, stirring until smooth. (If you like, melt in the microwave in 30 second intervals, stirring each time until smooth. Don't overheat). Line a muffin tray with paper candy cups. Spoon a bit of chocolate into each cup, spreading it up the sides. (A small paint brush works great for this). Chill until that chocolate sets. Fill the cups with the peanut butter mixture leaving space for a final layer of chocolate on top. Chill again. Spoon remaining chocolate over the tops being sure to completely cover the peanut butter. Allow to set until firm. Store in airtight container. Tips: You can find a selection of paper candy cups and cello favor bags at Candyland Crafts. These are great for gift giving or party favors. They also carry a wide range of molds, if you want to make specific clever shapes. If you are just going to eat them all yourself, :) you can make them without the paper cups by greasing the mini muffin tins and making them directly in them. Combine the first four ingredients and mix well. Press into a cookie sheet and roll to make it even. Melt together the chocolate chips and 1/2 cup butter over low heat, stirring until smooth. Spread chocolate over peanut butter mixture. Allow to cool and cut into small pieces. Hide from prying eyes!